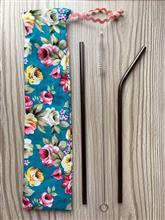 Three piece reusable straw set with carry pouch. These reusable straws are made from stainless steel with a black metallic finish. The set includes one straight straw, one pre-bended straw, a cleaning brush and a handmade fabric pouch for taking everything out with you so you don't need to use a plastic straw. Patterns of fabric bag may vary from the one pictured. Care instructions: hand wash straws in mild detergent and use the cleaning brush to clean the inside of the brush. Thoroughly rinse before drying. The fabric carry pouch is machine washable at 30 degrees.